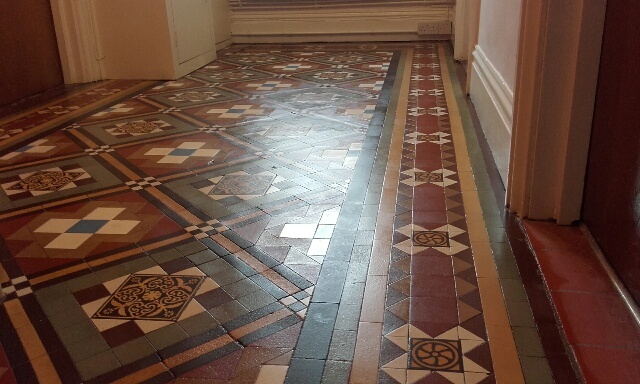 A Victorian tiled floor is a thing of beauty and a fantastic entrance to a period home but unfortunately many have had a hard time. Changing fashions have caused then to be covered over with all sorts of unspeakable floorings such as lino and carpet. More lately the dreaded laminate has been stuck on top of these beautiful tiles. If not covered up many have been left unloved and have ended up ingrained with years of dirt making them dull and unattractive. 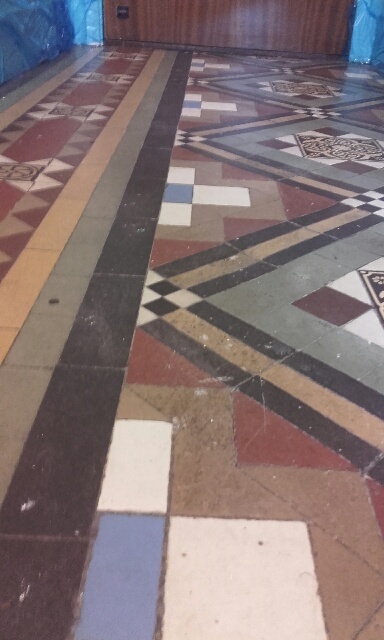 Its not just Victorian tiled floors that suffer such fates. 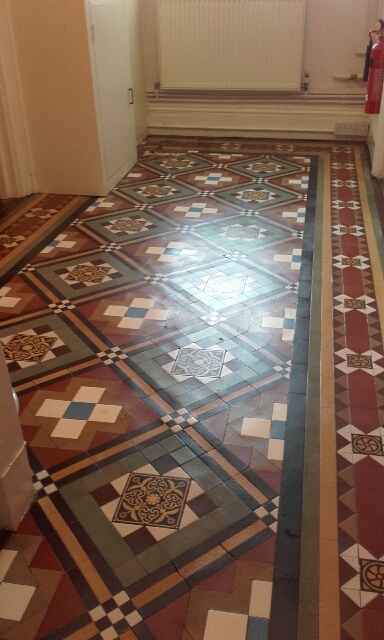 Many original quarry tiled floors or limestone or flagstone floors have been treated in similar ways thanks to changing ideas of what is fashionable. Don’t despair. The Rutland Cleaning Company can restore your natural stone or tiled floor and bring out the natural beauty hidden beneath the dirt or whatever had been put on top. 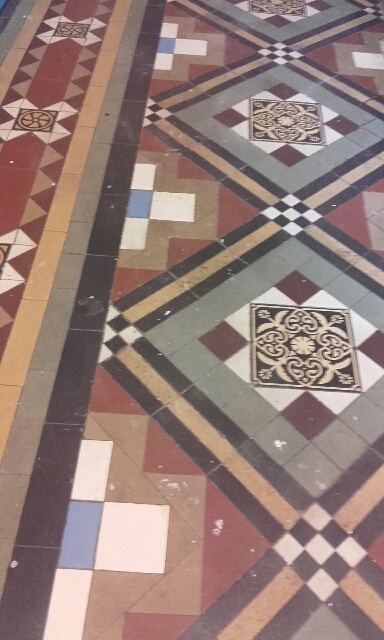 These are images from a floor we have recently restored. Its in a period building used as offices and has been left unloved for many years. It showed little evidence of cleaning and was heavily covered in paint. It also had evidence of an old seal that was worn away in some areas and flaking off in others. After masking up the entire area to prevent the cleaning products getting onto the surrounding paintwork a heavy duty stripper was then used together with our specialist rotary machine was used to strip off the old seal, paint and years of accumulated dirt. After a rinse the whole area was then cleaned using special brushes on our rotary machine with industrial diamonds in the brush strands which get deep into the surface of the tile to remove any remaining dirt and contaminants. Due to these tiles being set directly onto a sand base the floor needs time to dry. In this case we allowed the weekend assisted by turbo dryers before applying 3 coats on a topical sealer to protect the tiles, enhance their appearance and make them easier to maintain. Contact us now to see what The Rutland Cleaning Company can do for your floor to bring out the inner hidden beauty.